Clay Pots For Fund Raising. 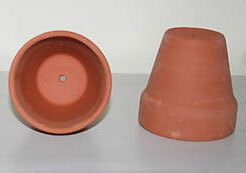 Use clay pots to make different crafts for fund raising. The following tip for using clay pots came from Julie in Australia. There are many crafts that you can make usings these pots. I coordinate Mother's Day, Father's Day & Christmas stalls at my son's school as part of the fund-raising. At present I have some of the small pots ready to paint and make into pin cushions. I have bought poly-styrene eggs to cover with green fabric/felt to resemble cacti with some of the pots and with the others I will halve round poly balls and cover with white fabric to look like ice creams in cones. I have also seen some made with fabric, stuffed with steel wool as this helps to keep the pins sharp. Hope you can picture these ideas and they are of use to you? At Christmas I have painted and decorated pots, attached a bell inside and added a ribbon and a bow to the top to sell at our stalls.